One of the best parts about being a Jeep owner is the fact that there are tons of events that happen across the country that allow Jeep owners to gather together and share their passion. Some of the events are small and some others are huge. 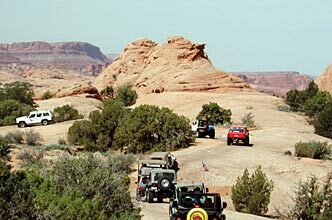 If you live in the Midwest and are looking for something awesome to do this spring you need to check out the Moab Easter Jeep Safari event. This event takes place in Moab, Utah from March 31st until April 8th 2012. The action packed week features a ton of trail rides, most of which take a full day to complete and is hosted by Red Rock 4-Wheelers Inc. If you want to attend this event you will have to register in advance to make sure you get the trail that you would like. They offer a wide range of packages including what they call a “First Timer’s” package that features three scenic trails that are aimed at Jeep owners who are newer to trail riding. All of these trials are of the tame variety, but they are still an amazing journey. The Moab Easter Jeep Safari also offers up something called a “Sophomore Package” which is designed to be a slight step up from the “First Timer’s” Package. This package offers up a new trail each day for three days. Each trail is in a different part of the park and offers a slightly more “intense” ride each day and also completely new scenery. Both these packages will include the same group of Jeep lovers each day and also the same group leader. This will allow newer members to meet and bond with some new people who will hopefully lead to new friendships and connections. If neither of these packages work for you or your skills you can look over the other trails offered up during the event and choose them “ala carte”. Just make sure you look them over and only do the ones that match your skill level. While it is great to push your limits from time to time it is also important to remember there will be thousands of other Jeep owners on these trails and you don’t want to delay them because you bit off more than you could chew. If you don’t live in the Utah area or can’t make it to this year’s event stay tuned to us and we will keep you posted on other great events around the country. Zach has done a huge amount of modifications throughout his Jeep owning history, and here is a list of just mods on his current two jeeps followed by a list of his previously owned Jeeps! Factory 10 Chromoly shafts w/ Cold Forged U-joints & full circle clips. Mr. and Mrs Harkness would like to thank you fro reading about their love of Jeeps and wish you many years of Happy Jeeping! The Jeep Jamboree official site says this about the Rubicon Trail “Originally a Native American footpath, the Rubicon Trail was used by explorers in search of a clear path across the Sierra Nevada’s. Today, Jeep® owners travel from all over to test their prowess on the most grueling 22 miles of off-road driving in America.” If you are looking for an exciting and challenging trail consider visiting the California High Sierra. Here is more about the great Rubicon Trail from the County of El Dorado Government website. “While the current trail travels the same route from Wentworth Springs to Rubicon Springs that has been used since the 1860s, it changes a little each season, due to erosion and vehicle traffic. As vehicles bypass “bad spots” or avoid broken or abandoned vehicles, the trail deviates more significantly from the original route. Drivers looking for a more “fun” route cause additional damage, as do today’s larger and modified vehicles, making their way over the much smaller original wagon road. Sections of the original wagon road are still visible where it was cut from the solid granite. Many of the rock formations along the route are unique, allowing identification from historic photos of the original route, which is crisscrossed in some areas by the 4-wheel drive road. The 4-wheel drive road also crosses a spillway built by PG&E in the 1930s and 1940s. The Rubicon Trail is now widely recognized as the premiere OHV route in the United States and has been called the “crown jewel of all off highway trails.” At one time, it was revered as the most difficult, rated 10 on a scale of one to 10, due to its narrow passages, rocky climbs, and occasional mud hole. Because of its difficulty, the trail is recommended for short wheelbase vehicles with all skid plates in place. The Rubicon Trail attracts both street legal and “green sticker” off-road motor vehicles. As a result, users travel the trail on and in wide range of all-terrain vehicles, including dirt bikes and a variety of 4-wheel drive vehicles, from street-legal SUVs to vehicles built for the sole purpose of driving the trail. Because the trail lies adjacent to the Desolation Wilderness, the Rubicon Trail is also used as an access route by hikers, backpackers, and fishers. The ceremonial Rubicon trailhead is in Georgetown, a small community nestled on the western slopes of the Sierra Nevada Mountains in California’s Gold Country. The much of town’s economy is centered on servicing and supplying many Rubicon adventurers and their vehicles. The Rubicon Trail is normally run west to east (traveling east to west is referred to as “running backwards”). The western end of the Rubicon Trail has two trailheads. The true trailhead is located at the Wentworth Springs campground, while the more popular trailhead is at Loon Lake. These trails converge at Ellis Creek, approximately one mile from the start of each course. The trail from the Wentworth Springs trailhead starts with an uphill climb. Once at the top, the trail levels out to a challenging drive to Ellis Creek. The trail from Loon Lake is more moderate. Beginning at the bottom of the spillway at the second dam, the trail passes through the Granite Bowl. It skirts Loon Lake on its way to Ellis Creek, where it joins with the Wentworth Springs section. From Ellis Creek, the trail winds through the trees on its way to Walker Hill. Walker Hill is a challenging, uphill area that offers drivers a number of difficulties. This area contains three sections, each with its own challenge. First comes the lower, rock-strewn section, which makes a sharp turn to the right. Second is 100 feet (30 meters) of extreme trail that makes a turn to the left. Finally, you reach the third, upper section, referred to by some as the “sandstone section,” which is difficult terrain over decomposing rock. At the top of Walker Hill is a wide spot in the trail in a small grove of heavy timber. From here, the trail continues on toward the Little Sluice. The Little Sluice is challenging and considered by many as the most difficult part of the Rubicon Trail. Though only about 100 feet (30 meters) long, it is heavily boulder-infested. In recent years degradation of the Little Sluice has been caused by OHV users who have winched large rocks off of the north cliff wall and into the Trail to artificially increase the difficulty of the Trail to create a rock crawling play area. Vehicles attempting to traverse the Little Sluice can experience damage to their oil pans, transmissions, and gearboxes, which then leak petroleum products onto the rocks and into downstream sediments. Once through the Little Sluice, most drivers take a rest near Spider Lake (Spider Lake is closed to OHV access), a high mountain lake just above a low hill on the south side of the trail. From the Little Sluice and Spider Lake, the trail continues for approximately a mile to a granite shelf overlooking the Rubicon Valley and Buck Island Reservoir. At this point, the trail forks to the Granite Slab on the left and the Old Sluice on the right. The Granite Slab route is more scenic and less time-consuming. It makes its way to the right and down the granite face of the mountainside, rejoining the Old Sluice fork approximately half a mile before the Buck Island Reservoir. The Old Sluice route is more difficult, following a section of the historic Rubicon Trail that is often bypassed due to its difficulty. The route is fairly level along the mountainside, first reaching the short Chappie Rock drop-off. From here, the trail continues on its level path until reaching another small overlook. From this overlook, the trail begins a gentle, then steep, descent into the Old Sluice. The Granite Slab and Old Sluice routes rejoin just past the bottom of the Old Sluice. From here, the trail crosses over the dam at Buck Island Reservoir. The trail then skirts the eastern edge of the reservoir and bears left, up, and over a low mountain pass before heading down to the Big Sluice. The Big Sluice is another challenging section of the Rubicon Trail. Though misnamed (the Big Sluice traverses the side of the mountain rather than being walled on each side), this long downhill section offers rock after rock to crawl over. Hi everyone! We have another great Featured Jeeper – Tim Chandler!!! XtremeTerrain: Tell us a little about yourself Tim. Tim: U.S. Army Retired (20 yrs), 47 years old, married to my lovely wife Paula (for 24 yrs!!!! ), two daughters 18 &21, Logistics Manager for the Department of Defense on Hill Air Force Base, UT. Tim: Dana 60’s front & rear, 37 inch tires. Tim: Horn 4X4 club & Wasatch Outlaw Wheelers, both from Ogden, UT. Tim: Around 19 years old. Tim: Seeing all the beauty this country has to offer & taking yourself & your vehicle to the limit. Tim: I wheel as much as I can & I’m concerned that we are losing more & more of our trails every year! If you wheel & are not part of the fight to keep our public lands open, you need to get involved! You can go to New York City to go shopping, people watching, or to stay up late soaking in the nightlife, or just 100 miles north of New York City you can drop by to enjoy 2 full days of the Catskill Mountains Jeep Jamboree in Monticello New York September 23-25th 2010. Although this Jamboree is sold out, it doesn’t mean you still can’t go and enjoy the fun! “Just 100 miles north of New York City, the Catskill Mountains play host to some of the best off-roading and good times in the Northeast. A wide variety of trails for both beginners and seasoned enthusiasts await participants. Endless mud, hill climbs, river crossings, and mountains of rocks are just some of what participants might encounter on any of our 12 different trails. The good times continue nightly at Jamboree headquarters, “Mr. Willys,” where Jeep® vehicle owners can test their skills on our 101 course or share stories around the bonfire. Good times and great trails are what keep Jeep vehicle owners coming back year after year.